Monumental Journey displays Joseph-Philibert Girault de Prangey's daguerreotypes which include the earliest surviving photographs of many notable cities and monuments in the Eastern Mediterranean. It seems there is always interest in early photography, especially early photographs of historic sites around the Mediterranean. Consider some recent examples: In 2016–2017, the Metropolitan Museum of Art mounted Faith and Photography featuring the French artist and scholar Auguste Salzmann's photographs of 1850's Palestine. Right now, Philadelphia's Barnes Foundation in From Today, Painting Is Dead is showcasing European photography from the 1840s through to 1880. The Met's current entry in the field is titled Monumental Journey: The Daguerreotypes of Girault de Prangey. The exhibition includes a selection of about 120 of the more than 1,000 photographs taken by Joseph-Philibert Girault de Prangey around the eastern Mediterranean between 1842 and 1845. Monumental Journey is organized largely according to the route Girault himself took on his travels, through what are now Italy, Greece, Turkey, Egypt, Syria, Lebanon, Israel, and the West Bank, before returning to France. Girault's daguerreotypes include the earliest surviving photographs of many notable cities and monuments in the Eastern Mediterranean: the Athenian Acropolis, Jerusalem, the impressive Roman temples of Baalbek, and more. Special display cases highlight his rare photographs of people, or the boxes he used to store his daguerreotypes back home. Texts on the walls as well as maps — including Girault's own map from the expedition — help to orient visitors. For anyone (like me) who hasn't seen daguerreotypes in person before, this exhibition will be a revelation. What struck me first is how small they are. Daguerreotypes are not prints from negatives — they are plates with positive (but reversed) images produced directly in the camera. This means their size is restricted by the camera and plates in use. Even using oversize cameras, Girault's images appear small. But this is also because he used many plates for multiple, separate exposures and afterwards cut them up. Even as miniatures, though, the daguerreotypes are remarkably detailed. At their best they are beautiful, even haunting images. This effect is intensified by the fact that many of them are not purely black and white, but have strong yellow and blue hues. Like many other practitioners, Girault gilded many of his plates after developing them, both to stabilize the image and to make them more striking. Many of Girault's plates were also overexposed, in what appear to be attempts to capture details in bright, outdoor lighting, with the blue Mediterranean skies bleeding into the images. In his photographic work, Girault combined two very separate strands: artistic and scientific. Like Daguerre, the inventor of the daguerreotype, Girault was a painter. Daguerre conceived of his photographs as individual, one-of-a-kind works of art; Girault followed through on this. His special process of multiple exposures turned the square plates into a set of remarkable panoramas and vertical views. Even when photographing monuments that were popular subjects of early daguerreotypes, Girault finds unique views — like the tops of circular buildings, such as the Temple of Hercules Victor in Rome or the Tower of the Winds in Athens. At the same time, Girault was a landmark figure in the developing field of histoire monumentale, the history of architecture. His photographs are meant to act as objective documentation of monuments. Especially notable is his focus on the history of Islamic architecture, which the exhibition appropriately describes as "groundbreaking." As a Frenchman in the eastern Mediterranean in the 1840s, Girault cannot be fully understood apart from the influences of Orientalism and imperialism. Monumental Journey highlights how he is both a product of them and, at least occasionally, transcends them. We see "relics" that he collected in Egypt (courtesy of the Musée d'Art et d'Histoire in Langres, Girault's hometown) — artifacts probably illegally smuggled out of the country, since Egypt had antiquities laws in place, but ones that individuals from powerful Western countries violated with impunity. (This legal context, though, is not noted in the exhibition.) We see mostly empty buildings and landscapes — a product at least in part of his primary interest in architecture — populated occasionally by indistinct figures used for scale or to provide some local color. The exhibition highlights a small set of photographs he took focusing on people, but, as with other Orientalist images of the time, they focus on people as types rather than individuals. But one image stands apart here: a Cairene woman, Ayoucha. As the accompanying text emphasizes, she is not only named, as opposed to just being identified by type, but her confident gaze also counters the typical exoticizing of women as curio objects. The Met is not afraid to highlight Eurocentric or imperialist aspects of Girault's work. This is key — it's impossible to fully understand Girault's journey without them. The discussions are brief, but the brevity implies that these elements are simply granted as true rather than actively contested. This frankness is remarkable. It also stands in contrast to the Met's concurrent World between Empires exhibition, which carefully avoids any discussion of Western chauvinism and imperialism in relation to the ancient remains of Western Asia displayed there. Perhaps it is easier to raise these questions when they are set in the 19th century and not the present day, and when they don't directly implicate the Met's own history of acquisitions. 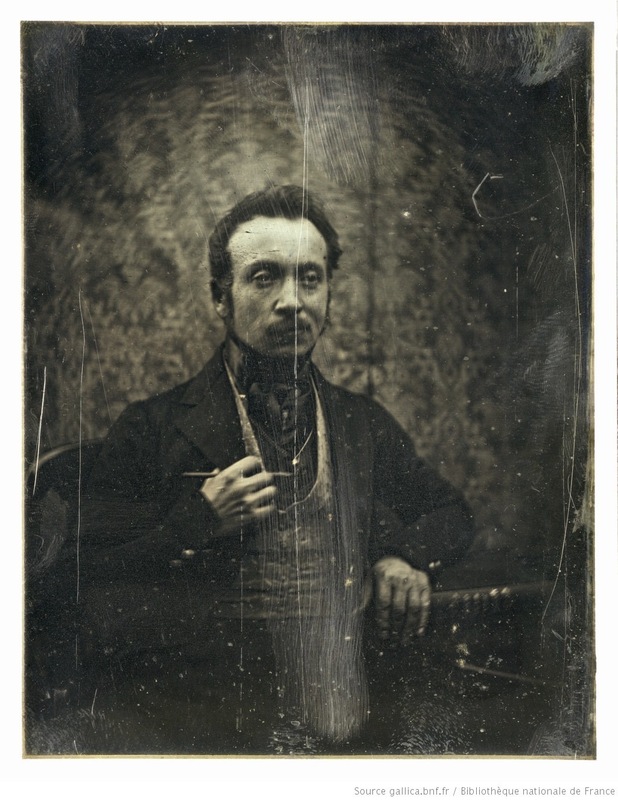 There is a famous cartoon called Daguerreotypomania, published in December 1839, that gives an idea of photography's role in France in the medium's early months. Representing, even parodying the craze for photography after being announced to the public earlier in the year, the print reflects just how far-ranging its effects were. Daguerre had sold his process to the French state, leaving it in the public domain. This meant that the process could be — and was — used widely from the beginning without concern over patents and lawsuits. It also meant that many were worried about the demise of more traditional arts. The title of the Barnes Foundation exhibition From Today, Painting is Dead is taken from a quote attributed to the French painter Paul Delaroche, on seeing his first daguerreotype around 1839. Daguerreotypomania, too, includes a gallows for engravers, whose career was seen to be rapidly ending. But these predictions didn't come to pass. Because daguerreotypes were positive images on metal plates, they were one-offs that couldn't be photographically reproduced. Unless they were exhibited publicly, few people ever saw them. For daguerreotypes to be distributed widely, they had to be turned into printing blocks, serving as the basis for engravings, etchings, or lithographs. While Girault's images are the earliest surviving photographs of many of the sites he visited, in many cases they had been the subject of daguerreotypes for years. Daguerre's decision not to seek a patent ensured that monuments and landscapes were photographed early and often. By the end of the first year of photography there were expeditions making daguerreotypes of sites on multiple continents. Perhaps the first to organize such ventures was the Paris optician Noël-Marie-Paymal Lerebours, who assembled a series of photographers to travel around the Mediterranean. They captured the first photographs of the Athenian Acropolis, the Pyramids, Jerusalem, and many other monuments and cities. The results were published — as engravings and etchings — in a series of volumes with the title Excursions daguerriennes starting in 1840. Monumental Journey does a good job in addressing this context. We see multiple lithographs made from Girault's photographs, used to illustrate his volumes on Islamic architecture. We also see two prints from Excursions daguerriennes, including an etching of the first photograph ever taken of the Parthenon. In it we see that the mosque built by the Ottomans during their control of the city is still standing. By the time of Girault's photograph three years later, the mosque is gone, replaced by scaffolding — the work of restoring the original classical grandeur of the Acropolis was well underway. The exhibition labels also note, very astutely, why many of these early photographs are now missing. Because they couldn't be reproduced, daguerreotypes were often seen as incidental to the truly important product, the lithograph, etching, or engraving made from them. In fact, the process by which many lithographs and engravings were made damaged or destroyed the daguerreotypes. We get a glimpse of this damage in Girault's daguerreotype of the Hippodrome in Istanbul (the racetrack of the ancient city, featuring an Egyptian obelisk moved here by a Byzantine emperor in the fourth century). Incised vertical lines are visible along the left edges of the minarets in the photograph — likely (as pointed out by the museum label) guidelines for the production of a print. Over the course of the following two decades, new processes improved the quality of photographic prints from negatives, and these came to overtake the daguerreotype in popularity. We see this reflected in a later self-portrait of Girault (in his garden) from about 1860 — this time not a daguerreotype but an albumen print (a process using egg whites) on paper. But even with these developments, albums of lithographs, engravings, and etchings continued to serve an important function. We could certainly do with more exhibitions centered on these media as a counterweight to the parade of shows on early photography. This will help give a truer sense of how people saw the world around them in the 19th century. But in the meantime, we can enjoy Monumental Journey. Monumental Journey: The Daguerreotypes of Girault de Prangey continues through May 12, 2019 at the Metropolitan Museum of Art (Met Fifth Avenue, 1000 Fifth Avenue, Manhattan). The exhibition was curated by Stephen C. Pinson, and organized by the Met in collaboration with the Bibliothèque nationale de France.